The 1S 3.7V 300 mAh Gens Ace 30C LiPo batteries are designed for use with small scale RC helicopters such as Blade mCPX and other similar models such as WLtoys v922, Turnigy FBL100 and others. These are intended to be used as an alternative to the stock battery and provide higher capacity and higher discharge rates to ensure longer flight time and better performance. We are used seeing very good results from Gens Ace batteries so far and we are having high expectations for these batteries, but let us see how they will perform in our tests. We have started the tests with a 1C discharge rate (0.3A) for the 1S 3.7V 300 mAh Gens Ace 30C LiPo battery and we’ve managed to get 308 mAh as a maximum capacity. This is a bit more than the manufacturer rating for this battery or with other words good start for the battery as we were expecting the Gens Ace meets its capacity rating. However what comes as a not so good surprise is that the constant discharge rate is about 20C maximum and not 30C as the specifications say it should be. Andjust to be sure it is not a problem with a particular unit, we have tested multiple batteries and all of them were not able to show better results. Gens Ace also sell 1S 300 mAh batteries with 15C rating and there could be some mix-up, however the boxes of the four batteries we have tested say that we’ve received the 30C model and not the 15C (we have ordered the one with 30C discharge rate). So a bit of a disappointment from this particular product from Gens Ace, but this just shows that not all of their products may be so good as we expect them to be. 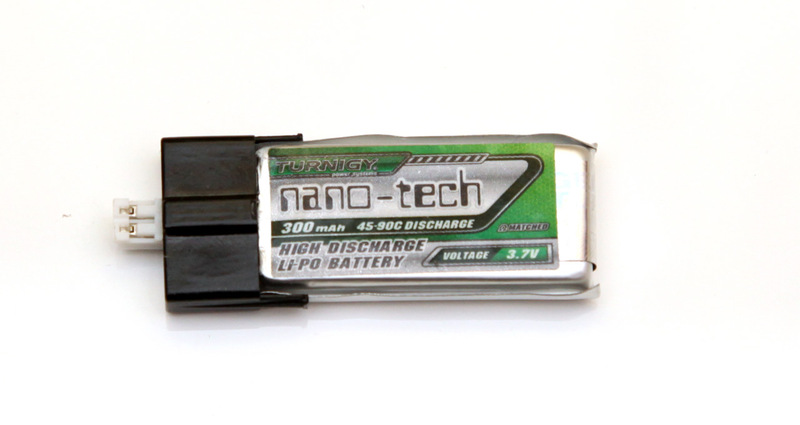 The 1S 3.7V 300 mAh Turnigy Nano-Tech 45C LiPo batteries are designed for use with small scale RC helicopters such as Blade mCPX and other similar models such as WLtoys v922 or Turnigy FBL100 and others. These are intended for a direct replacement with higher capacity and a much higher discharge rates (at least in terms of written specs). The Turnigy brand from Hobby King usually comes at very attractive prices and very good ratings, though we are used to seeing the batteries actually not performing as good as their specs say they should, so our expectations here are to see lower discharge rates than advertised. We have started the tests with a 1C discharge rate (0.3A) for the 1S 3.7V 300 mAh Turnigy Nano-Tech 45C LiPo battery and we’ve managed to get 320 mAh as a maximum capacity, or a bit over the manufacturer rating for this battery or with other words a pleasant surprise for a start. Increasing the constant current load further to 5C, 10C, 15C and even 20C and the battery still manages to provide capacity close to its manufacturer rating. At 25C discharge it is still handing Ok and offers decent capacity, but at 30C we see that it is already too much for the battery to handle and the rating is 45C as a constant discharge rate for the battery. The actual rating for these batteries for constant current discharge should be more like 25C and not 45C, but the capacity at the real discharge rates that the battery can handle are quite good. We have started the tests with a 1C discharge rate (0.3A) for the 1S 3.7V 300 mAh Dual Sky 25C LiPo battery and we’ve managed to get just 269 mAh as a maximum capacity. This means that even at 1C discharge rate these batteries are not able to deliver their rated capacity of 300 mAh and that is not a good start at all. Furthermore, increasing the constant current load we saw that the batteries manage to handle well up to 10C discharge rate as a maximum and they fail at 15C, so we did not continue increasing the load further as it was pointless. Dual Sky rates these as 25C constant and 50C burst discharge rate, but they should be more like 10C constant and 15C burst and more like 250 mAh actual capacity. In short, we are disappointed by the performance that these batteries have shown in our tests.